This article is adapted from a talk Dr. Lindsey gave prior to last year’s annual TarFest celebration in the Miracle Mile. 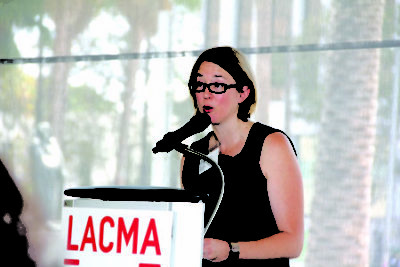 SPEAKING at LACMA at the launch of TarFest last year, Dr. Emily Lindsey. In 2016, I moved to Los Angeles to take the job of Curator at the La Brea Tar Pits and Museum. This site is a U.S. National Natural Landmark, is generally ranked as one of the top places for tourists to visit in Los Angeles, and is intricately intertwined with the history of Los Angeles itself. However, even many locals, I have found, aren’t entirely sure what the La Brea Tar Pits are, and in some cases misconceptions have arisen. Misconception 1: There are dinosaurs at the La Brea Tar Pits. Nope. No dinosaurs. (Sorry!) Well, that isn’t technically true, because birds are the living descendants of dinosaurs, and we have over 130 species of birds in our fossil collections. But the big, armored, toothy dinosaurs that you can see on display at our parent institution, the Natural History Museum of Los Angeles County (NHM), over in Exposition Park, disappeared from earth more than 65 million years before the La Brea Tar Pits began oozing up in Hancock Park (the County park, not the nearby residential neighborhood), back when Los Angeles, and most of the rest of California, were still hundreds of feet beneath the ocean. But if there aren’t any dinosaurs here, what do we have? 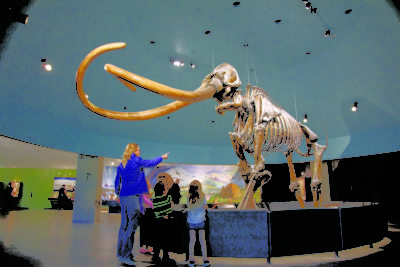 NOT TO BE CONFUSED with a dinosaur, an Ice Age mammoth greets visitors at the La Brea Tar Pits and Museum. We have giant animals —mammals, like us! — that lived here in Los Angeles not millions of years ago, but (only) thousands. Animals that saw, and smelled, and probably tasted — and were tasted by — people. Saber-toothed cats and dire wolves, mammoths and mastodons, camels and horses and bison, and (my favorite) — giant sloths. We have extinct species of lions and jaguars and bears that used to wander what is now Wilshire Boulevard. And we have other big mammals that aren’t extinct, like coyotes and deer. And species that might go extinct in the not-too-distant future, like grizzlies and pronghorn antelope. We also have less-giant animals, like those 130 species of birds, and lizards, and rodents. We have fish and snails and even insects preserved in our miraculous, ever-flowing goo. And we have plants too! If you need to be convinced, just walk past one of the fenced-off, still-active asphalt seeps in Hancock Park, and you will see thousands of incipient fossils of modern plants stuck in a tar pit, just as they have been getting stuck in our tar pits for tens of thousands of years. All of which makes this one of the only places in the world where scientists can look back in time and see not just one animal, or a group of animals, but an entire ecosystem of animals and plants, big and small, predators and prey; can start to guess at their behaviors, can divine their interactions, and can watch them move and change and travel through time until they come to where we are today, or disappear. Misconception 2: The people you see working in the excavations here in the park, and in the Fossil Lab inside our Museum, are actors — or a variation on this, are robots, or are part of a Los Angeles County Museum of Art (LACMA) art exhibit. People ask us about this frequently. And I get it. This is, after all, Los Angeles. And I have no doubt that, if we wanted to, we could get actors to come here and sit in the hot sun all day and pretend to be paleontologists. But we don’t need to do that — because we have real paleontologists! In fact, the La Brea Tar Pits is one of the most important paleontological research sites in the world. We have an active, growing, research department, which besides me includes postdocs, graduate students, excavators, fossil preparators, research associates, and collections staff. In addition, we have an army of incredible volunteers who dedicate their own time every week to helping us do science. And, we have scientists visiting from all over the world, almost every single day of the year, conducting research on everything from what ancient camels ate to how saber-toothed cats hunted to what kinds of molecules are preserved by asphalt to how animals adapt to climate change. As our planet moves into a warmer future, one of the greatest challenges facing scientists and conservationists working to save species will be to understand what plants and animals are going to do in a hotter world. Where will they go, what will they eat, which species are most in danger of going extinct, and which ones are most important for preserving other species? And, as they try to figure this out, it will be really valuable to know what these, and other species, have done when climate changed in the past. And we are incredibly lucky that one of the only places we know of on earth that captures an entire ecosystem moving through the last major episode of global climate change is right here in Los Angeles, at the La Brea Tar Pits. The potential that this site has to teach us about Los Angeles’ past — and its future — is incredible. But the Tar Pits’ location in the middle of the third biggest city in North America provides an opportunity to do something more — not just to conduct world-class research, but to communicate that research to the world. We welcome hundreds of thousands of visitors each year, including more than 50,000 Los Angeles school students. And, because we excavate, and prepare, and study fossils on public view year-round, we have a truly unique opportunity not only to teach about earth’s past, and about extinction, and about climate change, but to showcase the entire process of science, from discovery, to analysis, to results, all in one visit. This demystification of science, the empowering of citizens to engage in empirical reasoning themselves, is more important now than ever before, and it is up to institutions like museums, which count among the most sought-out, and trusted, sources of scientific information in our country, to take the initiative. Recent fossil discoveries during Metro’s Purple Line Extension excavations have reinvigorated the public’s excitement and awareness about the deep history of Los Angeles lying just beneath our feet; last summer we partnered with Metro and the paleontological monitoring company Cogstone, to showcase the preparation of one of their coolest finds, a juvenile mammoth skull, inside our Fossil Lab. We have partnered with the Institute of the Environment and Sustainability at UCLA to host a series of panel discussions about pressing social and environmental issues in our Museum gallery; in 2016 we debated Extinction; last fall our topic was Climate Change, and we are currently finalizing the theme for this year’s series. And, this past year, we partnered with LACMA and the South American art collective Mapa Teatro to produce a performance piece in our Fossil Lab as a contribution to their exhibit, “A Universal History of Infamy,” for Pacific Standard Time LA/LA, which just wrapped up a few weeks ago. With all the exciting new initiatives just on our block — the new Academy of Motion Pictures Museum, LACMA’s coming reconstruction, the Purple Line — it is a new dawn on the Miracle Mile, and the Tar Pits is no exception. As we develop as an international research center and an unparalleled opportunity to educate people about climate change and the scientific process, we are excited to continue partnering with our neighbors on projects at the intersection of science, art, and learning. A lot of people I meet here in Los Angeles tell me that they love the Tar Pits, but that they haven’t visited since they were a kid. And perhaps because of this, or because of the yellow school busses often seen parked along Curson, some people think that the Museum is primarily a destination for schoolchildren (but it’s not — that’s Misconception 4). The Tar Pits comprise a vibrant community of real scientists doing real science, and we’re trying to use a bunch of dead things to save the world. So the next time you’re in Hancock Park, I invite you to check out the signs describing the discoveries from our still-oozing asphalt seeps around the museums. Watch fossils tens of thousands of years old being unearthed before your eyes. Come inside to see paleontologists piecing together and 3D-scanning bones of animals that roamed the Miracle Mile when half of North America was still covered in glaciers. Watch a film about climate change in our 3D theater, or meet our life-sized saber-tooth cat puppet, Nibbles, and our performing artists who bring him to life. You may just find that you want to stick around, too. Dr. Emily L. Lindsey is assistant curator and excavation site director at the Los Angeles County’s Natural History Museum La Brea Tar Pits and Museum. She also is an adjunct faculty member at the Institute of the Environment and Sustainability at UCLA. Lindsey studied at Brown University and UC Berkeley, and was a Fulbright scholar at the Museo Nacional de Historia Natural in Uruguay. She joined the Natural History Museum staff in 2016. « What’s changed in Southern California since the last century? Everything.